A forestry business owner and his dog-walking daughter are urging council planners to reconsider their rejection of the pair’s plans to build a dog daycare centre and workshops in Galashiels. 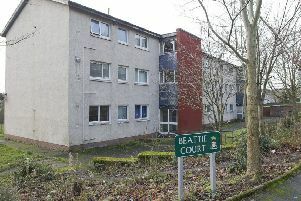 Wilson Jamieson, of Barr Road in Galashiels, had applied to Scottish Borders Council for permission to site seven workshop units and a dog day centre at his depot in the town’s Langshaw Road. The Farknowes depot , currently home to more than 80 storage containers, is owned by Mr Jamieson’s company, Wilson G Jamieson Forestry and Fencing, and his daughter Leonie Jamieson runs Galashiels Dog Walking Service. The plans would have seen Ms Jamieson set up a permanent headquarters for her business, including office space and an exercise paddock for dogs, but council planners knocked back the proposals, saying the Jamiesons had not shown there is sufficient economic need for such a development in the countryside and that the aesthetics of the units would not be in keeping with their rural setting. Now, the Jamiesons’ agent, Galashiels-based Gain Planning Services, has lodged an appeal with the council. In a statement outlining their reasons for appeal, the firm’s Peter MacLeod says: “The proposed workshops would provide a valuable resource to local small businesses at an affordable price. “The proposal makes good use of surplus land within the applicant’s ownership, benefiting from the existing infrastructure, access, on-site facilities and security within the existing site. “The use is a relatively low-intensity one and the units have been carefully sited and coloured to blend in with the surroundings. The council’s local review body is due to meet on Monday, February 18, to discuss the appeal.